The CA-125 test measures the CA-125 blood level. What is a CA-125 test? Why is a CA-125 blood test important? The CA-125 lab test can help with tracking the progression of ovarian cancer. This CA 125 Test is a blood test. 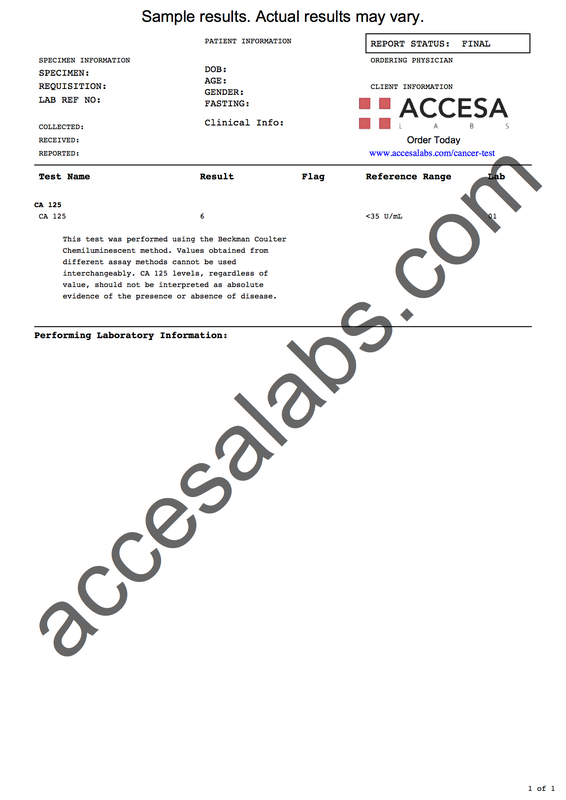 The CA-125 test, also known as the, CA-125 blood test, CA-125 lab test, carcinoma antigen 125 and cancer antigen 125 test, measures the CA-125 blood level. CA-125 is a protein that is used clinically as a cancer marker. In particular, CA-125 levels tend to be higher in cancer cells originating from reproductive (e.g. ovaries) and gastrointestinal (e.g. stomach) organ sources. In practice, CA-125 blood levels are sometimes used to evaluate the response to cancer treatment and also check for recurrence. Elevated levels of CA-125 in these situations increase the likelihood that the cancer may recur. Some controversy exists as to whether CA-125 testing should be used as a screening tool for ovarian cancer in women without symptoms. To get a CA-125 test near you at a Quest Diagnostics lab, simply order online and then get your blood drawn at your selected lab. Once your CA 125 lab results are available, they will be sent to you electronically. The CA-125 sample lab report provided above shows that a result of 6 U/mL were reported and can be compared against the lab's reference range of <35 U/mL. Regardless of reference ranges, however, CA-125 blood levels cannot be used in isolation as absolute evidence of the presence or absence of a disease and all results should be evaluated in conjunction with a licensed medical provider. This CA-125 test is often ordered with the AFP test, CA 15-3 test, and the CEA test. CA 125 Test at Guaranteed Prices.